Since fresh exotic fruits were a rarity in the Soviet Union, pictures of these products featured prominently in cook books, leaving people to associate fruits with distant exotic locales. Walking past the numerous fruit and vegetable stalls of Tbilisi, I couldn’t resist the urge to use the beautiful local peaches to cook something. The most appropriate recipe in the Book was called “peach soup;” strange, but probably good, I thought. I always had a ‘thing’ for peaches growing up. I just loved how sweet and juicy they tasted, and was always excited to get a good one; at a beach by the Black sea or, occasionally, even in Moscow. I remember dreaming of going on a diet made up entirely of fruit. My obsession with fruit was not unique. Fruit still retains a mystique for most Russians. It was not easily available in the Soviet era and became associated with luxury, the good life, summertime and exotic destinations. My Australian friend’s questions made me realize, for the first time, that Russians do indeed have a fruit obsession. When I was a teenager and, naturally, bent on spending as much of my mother’s hard-earned money as possible, she would convert the price of some clothing item I considered a good deal into a banana equivalent: “You could get 3 kilos of bananas with this money!” she would say. When mom was growing up, bananas were rare and expensive, and the words “basket of fruit” sounded like “pile of gold” to her. I asked Granny when bananas made it back to the USSR – she couldn’t quite recall, but said “late.” Unlike those pre-revolutionary kids, she and her generation never really developed a taste for the exotic fruit. When Granny came to visit me in Tbilisi, she was mostly on the lookout for dried fruit – the more practical version that serves as a replacement for fresh fruit in the winter. We live in a cold climate, after all. I wonder if Granny’s lack of concern with exotic fruit is just part of her generation’s acceptance of their reality. Is it possible that, for people younger than her, peaches and bananas give the illusion of going to a warm place, where there is no metro, snow or Soviet diet – even just for a couple of minutes? The peach soup, which tasted fine, but still seems like an odd idea, might be able to do just that —although the fresh fruit on its own would do a better job. 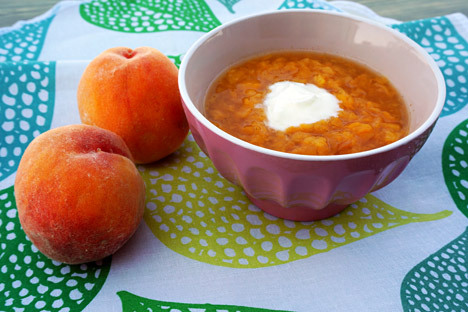 After all, when you have ripe peaches, why put off the deliciousness by boiling them with sour cream? Choose ripe peaches and wash them. Put in a saucepan with six cups of water. Canned peaches can be used in place of fresh ones. When fruit is boiled, mash well. Into the mashed fruit, add sugar and some cold water until soup reaches the right consistency. Bring to a boil, then remove from heat. Add rice and sour cream or cream. Mix well.